Discussion meeting on impact of GMO Crops: Bt Brinjal and Golden rice was held on 2 November, 2015 at the National Press Club, Dhaka. 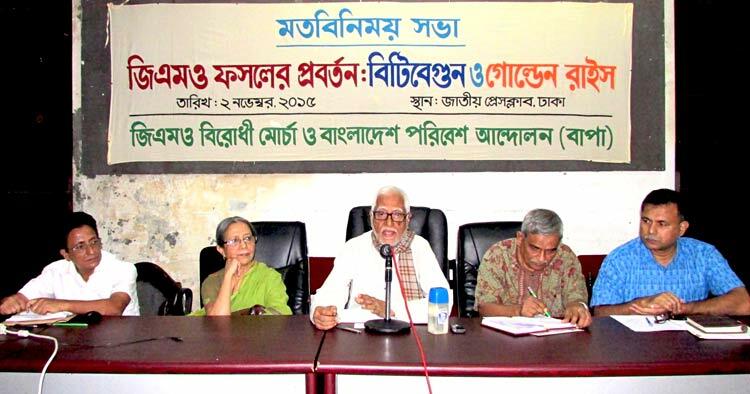 GMO Birodi Morcha and Bangladesh Paribesh Andolon (BAPA) jointly organized the discussion meeting. The environmental activist, development workers and journalist participated in the discussion meeting. Professor Moazzem Hossain, Vice President, BAPA chaired the discussion meeting. Farida Akhter, Member, GMO Biridi Morcha, presented the key note speech. The panel speakers were Delowar Jahan, Staff reporter, The daily Shokaler Khabor; Dr. M. A. Sohban, agricultural scientist and Sakiul Millat Morshed, Executive Director, Shishuk. The other speakers included Samiron Biswas, CCDB, Bangladesh; Ibnul Syed Rana, member, Shaystha Andolon; Harun-or- Rashid, researcher, UBINIG and Abdul Zabbar, researcher, UBINIG . Jahangir Alam Jony, member, GMO Biridi Morcha, moderated the discussion meeting. Millat Morshed said that Bt brinjal was approved for cultivation in 2013. It was cultivated for two years in Bangladesh. Recently, Golden rice has also been approved for field cultivation. Most of the farmers incurred loss from cultivation of Bt brinjal. In 2013 -14, out of 20 farmers 13 farmers claimed compensation for loss of Bt brinjal crops. The situation of Bt brinjal in 2014-15 is also a case of crop failure. Under these circumstances, Golden rice is also being extended. This is a case of great concern that the main staple crop like rice is under threat due to genetic modification. Withdrawal of Bt brinjal and stopping the decision for trial of Golden rice should be considered forth with. Farida Akhter said, information collected from all the 19 districts revealed that field cultivation of Bt brinjal for the second time in 2014 -15 rabi season was done under direct supervision of the scientist of the Bangladesh Agricultural Research Institute (BARI) and the officers of the Department of Agriculture Extension (DAE) taking care like a patient in an intensive care unit under life support. In fact the farmers only provided the land and rest of the cultural and inter cultural operations were conducted by the officers of the DAE and scientist of BARI. It was observed that the land of the farmers was used for cultivation of Bt brinjal but the farmers could not produce it. Initially, the farmers did not know that they were offered seedlings of Bt brinjal. Signboards of Bt brinal were posted by the DAE when the seedlings were grown up. The farmers had little information of Bt brinjal to share because the records were kept by the DAE and BARI. Bt brinjal was not at all promising in terms of yield when compared with the local varieties of brinjals, the farmers had shared. The appearance and keeping quality of Bt brinjal was not attractive and become pale, dull and wrinkled quickly when it was taken to market for sale. In most of the cases Bt brinjal was sold in whole sale market, mixed with other local varieties and sent in distant markets for selling. This is because the local customers did not like to buy it. Based on these unacceptable yield and quality of Bt brinjal it should be stopped for further cultivation. Introduction of GM crops in Bangladesh was initiated with Bt brinjal, now there is effort for releasing Golden rice and there are more on the pipe line. In many countries across the globe there are public rejections of GMOs but it is observed with deep concerns that GMOs are introduced in Bangladesh one after another even though there is loss of crops in significant occasions. Delowar Jahan shared his experience of visiting Bt brinjal farmers’ fields in 2013 -14 and 2014 -15. It was a sad experience of loss of brinjal crops by the farmers in different parts of the country. The farmers not only lost their crops but also lost their image as successful farmers. Dr. M. A. Sobhan mentioned that there are at least 28 disease pest of brinjal including fruit and shoot borer in Bangladesh including virus, fungi, bacteria, nematode, mite and insects. There are 248 local varieties of brinjal available in Bangladesh. The local varieties have resistance to most of the pathogen and pest of brinjal. Brinjal has been modified by incorporating gene from Bacillus thuringiensis for resistance against fruit and shoot borer (Leucinodes orbonalis). Sweepingly it is claimed that Bt brinjal is free from pest. It does not need any application of pesticides for disease pest control. But in reality it is observed in the field that Bt brinjal is affected by many disease pests. In 2014 -15, it was learnt from the farmers that the BARI and DAE sprayed at least five banned pesticides including Basudin, Bidrin, Darsbun, Diazinon and Furadan in Bt brinjal fields. Many other pesticides were also sprayed in Bt brinjal fields but none from the list of recommended pesticides for brinjal in Bangladesh. The other speakers mentioned that Bt brinjal was cultivated for last two years and Golden rice has been offered for cultivation this season. Introduction of GMOs are threat to biodiversity, environment and human health. It is a matter of great concern that GMOs are introduced in great numbers in Bangladesh when there are initiatives to ban GMOs in the developed countries. It is strongly urged upon the government that the introduction of GMOs should be stopped in the interest of the people. Professor Moazzem Hossain in his concluding remarks mentioned that it appeared form the presentations of the different participants, the performance of Bt brinjal in farmers field during 2013 - 14 and 2014 - 15 it was a losing concern of the farmers. There is sound demand for stopping the extension of Bt brinjal. a)	The meeting demanded for publication of a white paper on the cultivation of Bt brinjal in farmers field for last two years showing the compliance of the terms of reference and bio safety rule of the approval of Bt brinjal for cultivation. b)	Bt brinjal should not be extended third time among the farmers considering the loss incurred by the farmers. c)	There should be poll for public opinion before introducing GM crops, one after another. d)	Let there be survey for assessing demand before taking Golden rice to field cultivation and in no case Golden rice should be given to the pregnant mothers on health ground. The meeting urged for stopping the cultivation of Bt brinjal immediately and withdrawing the approval order for field trial of Golden rice.